The difference between business success and extinction isn’t simply having a good idea or product – it’s having people – not consumers – who are passionate about your brand and engaged with it at an emotional level. People give their best because they really want to. In this way, success is about capturing hearts as well as minds. Organizations implement a variety of ways to try and make this connection with their internal audience, and one key means of doing so is a planning a national conference, convention or meeting. When you plan your corporate event, consider the reasons you are bringing your people together. A corporate convention brings you face-to-face with the key stakeholders directly responsible for the organization’s success – store managers, salespeople, dealers, franchisees, brokers, etc. These constituent audiences ultimately represent your brand and corporate image to the end customer. 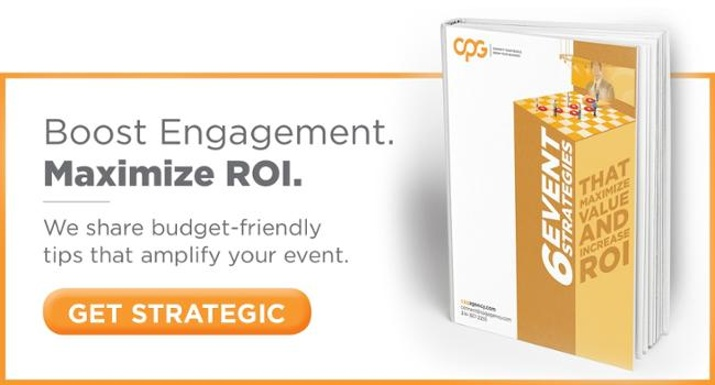 Producing a strategic, engaging event that connects with this internal audience can deliver meaningful results and leverage your return on investment. Whether your meeting is for 300 or 3,000 people, it’s important to strategically plan all aspects of the meeting – from developing the theme to the overall messaging to the communication objectives you want to achieve. Thinking strategically vs. tactically will connect everyone on a firmer, more lasting basis. Begin by setting clear objectives. What exactly do you want your audience to walk away with? Many times motivation is the ultimate goal, but often there are other – just as important – objectives such as the details of a new product, educational objectives, new brand standards and recognizing top performers. Determine the key messages early and focus on engaging your audience throughout the conference to keep the energy at a level that’s consistent with your strategic plan. Successful companies will tell you that some of the most effective marketing communications they do is to their internal stakeholders. This internal marketing is strategic since an audience is more likely to be receptive to a meeting’s content, to believe it and remember it when they are emotionally engaged. We’ve produced conventions for some of the world’s most successful organizations, and they’ll be the first to tell you the proof is in the pudding. Offering engaging vs. passive elements throughout your conference will result in higher energy and a stronger connection. So, how do you strike that emotional chord and engage your audience? A large business meeting or convention is similar to a theatrical experience. It must be approached from a design standpoint to not only deliver the appropriate content but maximize the engagement. INTERACTIVITY: A great meeting involves two-way dialogue, collaboration and genuine interactivity. Offering interactive elements throughout the event allows your audience to address common challenges and feel involved while offering an unscripted dynamic. Interactive elements can be as simple as Q&A panels or more sophisticated mobile apps that include pools, quizzes and social streams to help build community. AUTHENTICITY: It’s difficult to build any sense of loyalty and respect if your audience isn’t convinced what they’re viewing is authentic. Interview actual employees, franchisees, etc. across a broad demographic and use real stories to communicate success and how they’ve overcome common challenges. Testimonials are an important element to developing authentic emotion. VIDEO: Video is a key component to any meeting. It’s not just a break from the ordinary, it’s truly a way to use a variety of elements (music, imagery, animation) to inject a specific emotion and provide a rhythmic structure. Video can be as simple as testimonial interviews, or as complex as producing a multi-city tour to be shown at the conference. Just as important, videos produced for the meeting can be repurposed for marketing and training after the event. HUMOR: The use of humor is an age-old, universal method to connect with people. It’s a great way to break the ice, tell a story and engage. The use of comedians, spoof videos, improv groups, etc. are all timeless ways to connect. Humor can simply be an entertaining act or be incorporated into presentations or keynote addresses. The best way to connect with people is to remember they are just that – people. Turning information into stories that everyone can comprehend and emotionally relate to is a powerful occurrence, one that influences belief, motivates change and inspires people to act. Executive presentations communicate a message, but do they tell a story? Do they offer an engaging narrative of compelling characters, a motivating plot and act as an agent of change? Each of these elements should be considered throughout the meeting, especially when used for recognition and sharing best practices. Stories should be interesting, entertaining and, of course, emotionally engaging. Your brand is what your key stakeholders and end consumers view as your external identity and ultimately relate to. It’s important to understand your brand and your company’s culture when strategizing your corporate event or convention. Effectively understanding your brand means understanding the message and experience you want to deliver. Creating a brand experience is an important element to effectively drive home the messaging and emotional engagement to your audience. The meeting’s theme, logos, collateral, speaker presentations, stage design, entertainment, videos and web pages all reflect the brand and contribute to a memorable brand experience. To really get a sense of a meeting’s ROI, you need to measure results, of course. Surveys are the most common way to do this and, in order to get the truest measurement, survey attendees before and after the convention. In addition to providing a baseline, the pre-survey can also inform decisions about the content for the convention. Beyond measuring whether attendees enjoyed the meeting experience, a good survey can measure what they learned and how their beliefs changed to help better measure the return from the sizable investment that conventions represent. An often overlooked element to business meetings is keeping the emotional engagement going after the event is over. Post-event communication is a critical way to sustain the passion and motivation created at the conference. While it’s impossible to achieve the energy levels at the event, touchpoints following the meeting contribute to leveraging your return on investment. Effectiveness is greatly increased through targeted, relevant messaging used before and after the event. Annual events with key stakeholders can be leveraged through year-round marketing communications campaigns. Now Bring It All Together! We compete in an emotion-driven economy. People, whether they are customers, employees, franchisees or dealers, are naturally predisposed to make decisions based on their level of emotional engagement. It’s the key to productivity and sustainable profitability because an emotionally engaged internal audience produces exceptional outcomes. Companies invest big dollars in HR, marketing, sales, training – each producing messaging and media. Successful organizations understand that an integrated strategy produces the greatest ROI. When you make your internal conference part of that integration with a strategic, emotionally engaged focus, you invest in one of your most important assets – your people.